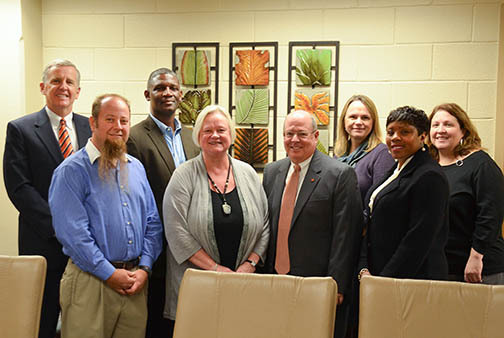 On Wednesday, November 8, Auburn University Trustees Robert Dumas and Michael DeMaioribus visited the College of Education to spend time with Dean Betty Lou Whitford and tour the Learning Resources Center and Kinesiology Building. The Trustees also learned about COE program and research initiatives. In particular, they heard brief presentations from faculty members on STEM Education and minority graduate student recruitment. Taking part in the presentations were Drs. Jared Russell, Christine Schnittka, Marilyn Strutchens, Brian Parr, and Megan Burton.